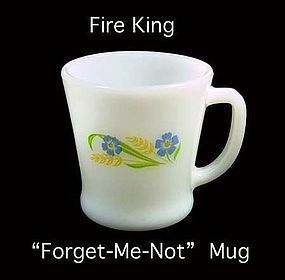 This Fire King coffee mug has the Forget Me Not pattern on it, and is in excellent condition. 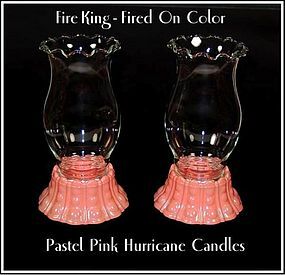 These fired on pastel pink hurricane candles are in excellent condition, and are part of the Fire King Rainbow line. These are getting harder to find. Hocking Glass is the maker. 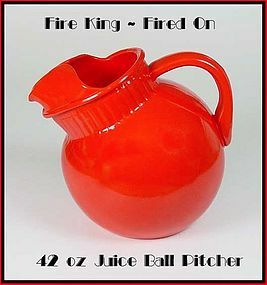 This fired on red/orange Fire King tilted ball juice pitcher was made by Hocking in the early 1940's and is in original condition! 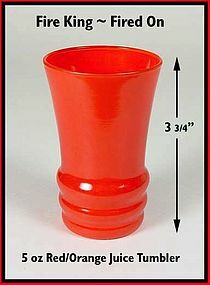 This fired on red/orange Fire King 5 oz juice glass was made by Hocking in the early 1940's and is in original condition! 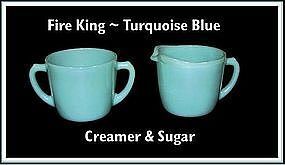 This Fire King Turquoise Blue creamer and sugar set is in excellent condition. 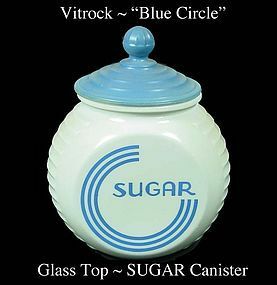 It was made by Hocking Glass. 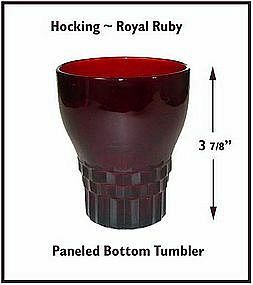 These Royal Ruby paneled bottom water tumblers are in unused condition! 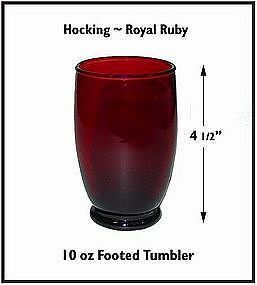 These Royal Ruby 10 oz tumblers are in unused condition! 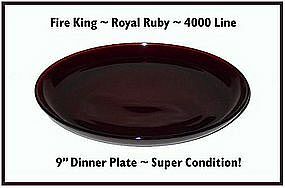 These Royal Ruby 4000 Line 9" plates are in unused condition! 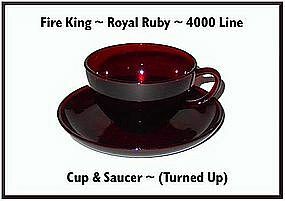 These Royal Ruby 4000 Line cups and saucers are in unused condition! 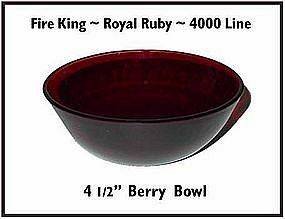 These Royal Ruby 4000 Line berry bowls are in unused condition! 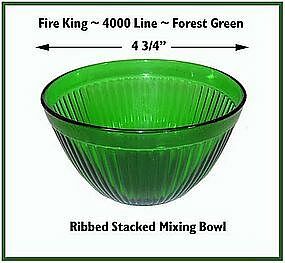 This forest green ribbed 6" Fire King bowl was made by Hocking. They are very hard to find in this color! 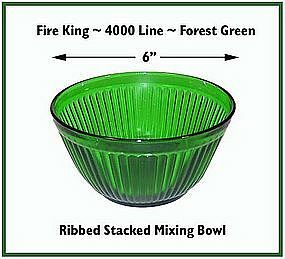 This forest green ribbed 4 3/4" Fire King bowl was made by Hocking. They are very hard to find in this color! It has some minor ruffness around the bottom. 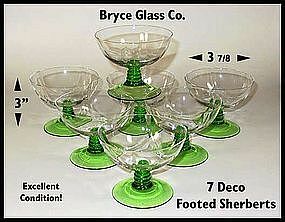 The second photo shows the two size bowls we have for sale. 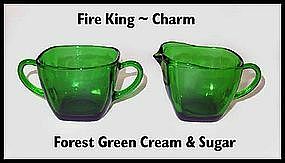 This forest green "Charm" cream and sugar set is in excellent condition! 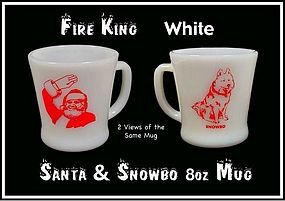 These Fire King 2000 items are an offering by Hocking Glass Co. in the year 2000. 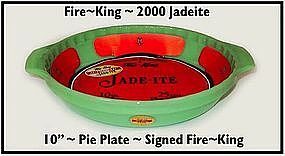 They were the company that originally made Fire King. 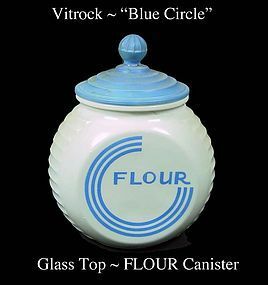 They have their original labels and stickers, and are clearly marked and dated. This item was never used and is beautiful!